At a fraction of the cost of a helicopter, it's no surprise that public safety agencies and media companies are eyeing drones for serious work. But how to monitor and control them? 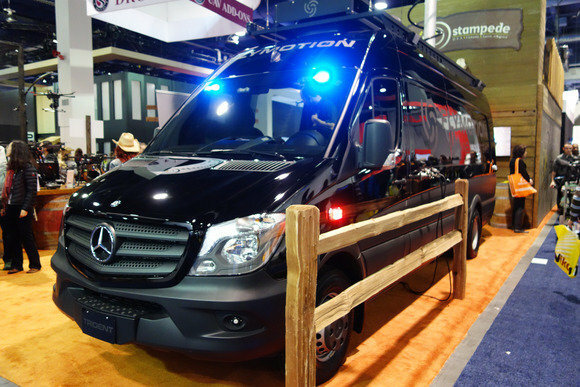 The Trident is a converted Mercedes-Benz van that can act as a complete mobile command post for drones. From the outside, the drone looks much like the existing command vehicles used by law enforcement or broadcasters, thanks to two antennae on the roof. That similarity extends to the inside. Two large flat-panel displays dominate a control desk and can be used to show video feeds from two to eight different sources. Those feeds can come into the truck directly from optical or infrared cameras in drones and surveillance cameras or through microwave downlinks on helicopters. Monitors show video feeds from drones and other cameras in the FlyMotion Trident at CES in Las Vegas on Jan. 7, 2016. 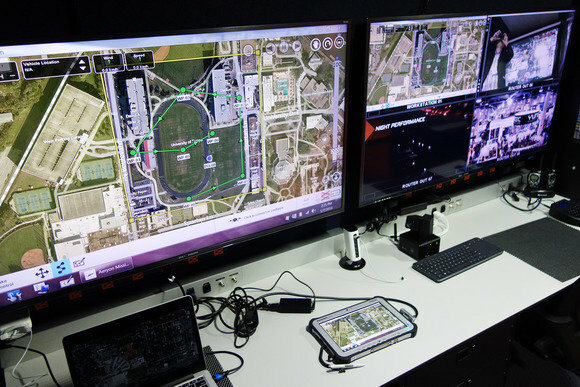 Operators can use the flat screens to monitor video while controlling drones from tablet computers. In a demonstration at CES in Las Vegas on Thursday, drone control software was shown running on a Panasonic Toughbook computer, with the screen mirrored onto one of the much larger displays. The video is received, processed and controlled through a rack of equipment that sits to the right of the control station. To its left is a digital whiteboard that, in the demonstration, was showing a map on which operators could write and annotate as needed. 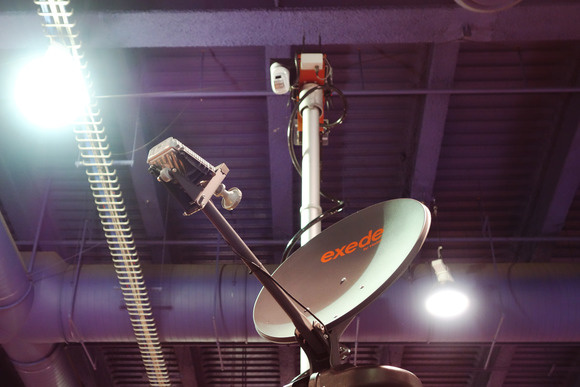 A satellite antenna and telescoping mast antenna on a FlyMotion Trident at CES in Las Vegas on Jan. 7, 2016. From the truck, video can be streamed over satellite or bonded cellular using LiveU, a high-definition video streaming system that is popular with broadcasters. This enables images to be shared with a larger group of people off site. It can also use Ka-band satellite broadband from ViaSat. The vehicle was developed by FlyMotion, a Tampa, Florida, company that is pitching to law enforcement agencies, search-and-rescue operators and TV broadcasters. Many of the company's employees are former military or law enforcement officers and saw a need for such a command post as drone technology started becoming popular, said Ryan English, president and co-founder of the company, in an interview. The FlyMotion Trident at CES in Las Vegas on Jan. 7, 2016. He said the system is customizable and configurable to other vehicles and the company plans to introduce a system built into an SUV in the coming weeks. The Mercedes Benz Sprinter fully equipped with the Trident system costs about $300,000, he said.